Trust in the media is all over the map in the U.S., but Americans’ political leanings are likely indicators of what news outlets they'll follow, as well as their general attitudes toward the press and the likelihood that they’ll financially support a news organization, according to a recent report published by the Reynolds Journalism Institute at the University of Missouri. But there’s one thing Americans seem to agree on across demographics and political leanings: web-based news outlets, regardless of whether they lean conservative or liberal, account for the least trusted organizations in media today. The Reynolds Journalism Institute report, which sought to understand Americans’ views of the news and what media organizations they support financially, yielded some telling findings regarding what outlets Americans are likely to trust and support based on age, race, gender and political demographics. The report was derived from findings supplied by 28 partner newsrooms across the U.S. who separately asked their respective audiences to tell them which news brands they find trustworthy. Respondents, who were supplied with an opened-ended questionnaire, were allowed to list three news sources they typically trust and three sources they don’t trust. As it turns out, international affairs mainstay The Economist won the honor of being the most trusted news source among Americans. That UK-based weekly magazine, which launched in 1843, beat out public television, international news agency Reuters and public service broadcaster BBC, which were cited as Americans’ second, third and fourth most trusted news sources, respectively. Publicly funded media groups NPR and PBS took fifth and sixth place, while British daily newspaper The Guardian filled the seventh spot. News Corp.-owned Wall Street Journal, Tribune property Los Angeles Times and the Dallas Morning News completed the top 10 list of most trusted news organizations among Americans. 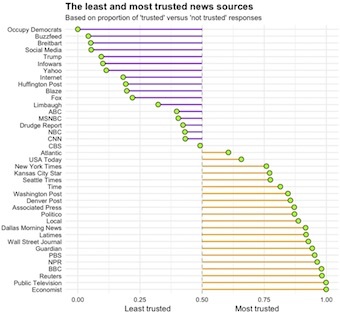 Somewhere in the middle was The Washington Post, The New York Times and USA Today, which came in at the 15th, 19th and 20th most trusted sources, respectively. Last place went to left-leaning advocacy group Occupy Democrats, which was cited as the least trusted news organization among Americans. That online publisher, which was founded in 2012, was recently ranked by fact-checking website PolitiFact as having more than a third of its stories qualifying for a “Pants on Fire” designation in the truthfulness department. Millennial-focused online news and entertainment site BuzzFeed won second-least trusted site, followed by conservative blog Breitbart. Social media overall took fourth-least trusted spot, followed by President Trump. Incredibly, Trump was beaten by conspiracy theorist Alex Jones' Infowars site, which took the sixth spot. Yahoo, the Internet, the Huffington Post and Glenn Beck’s The Blaze rounded out the top 10 least-trusted news outlets. This means that barring President Trump, each of the least trusted news sources in the U.S. is a digital publisher. The report found that those identifying as liberals cited The New York Times, NPR and The Washington Post as the most trusted news sources. Those labeling themselves as conservatives, on the other hand, trusted Fox News more than any other outlet. More than two-thirds of respondents said they pay for at least one news source. Older respondents were far more likely to declare doing so than younger adults. White respondents were also more likely to trust the media and to pay for news services than nonwhite respondents. Finally, the report also found that self-described liberal respondents tended to exhibit more trust toward media outlets — and to pay for them — than conservative respondents. For that reason, the report’s participants most likely skew somewhat left of center, as 67.3 percent of responses came from those who rated themselves likely or very likely to trust the news, with the remaining 32.7 percent claiming they're unlikely or very unlikely to trust the news. The report also acknowledged that due to the number of newsrooms participating in the study and an unbalanced participation of their readers, it’s possible that a single newsroom with a high response rate could systematically bias the statistical analysis. Results for the Trusting News Project Report were based on a statistical analysis of nearly 8,800 online respondents who answered a questionnaire provided by 28 U.S.-based media organizations. Data was collected between February and March.